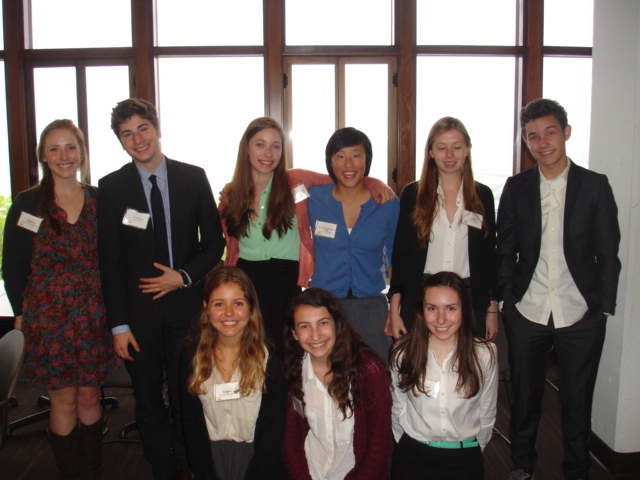 May 14, 2013 – Since late September, members of the Seattle Academy Model United Nations club have been looking forward to participating in the day-long VIKMUN conference at Western Washington University. The group, supervised by Mia Mlekarov, began to prepare for the event in March, when they chose their countries and committees. Members are required to possess a thorough understanding of the country they are representing, including allies, past policies, current events, and additional information depending on their committee. The more prestigious committees, such as the Security Council, are usually reserved for the more experienced competitors, due to the complexity of the topics. The General Assembly, which includes every UN member country, is more suited to first time competitors. Once the team was assigned to their countries and committees, they began to research and write position papers on their topics. The Security Council, for example, debated over possible solutions to the crisis in Syria, while the General Assembly, deliberated over guidelines for the return of a country’s stolen cultural property. In both the Model and real United Nations, all delegates are required to speak and conduct themselves in a specific manner, referred to as “Parliamentary Procedure.” Any time delegates wish to speak, they must raise their placard to indicate that they want to put their name on the speaker’s list. Once the moderators feel that enough delegates have spoken from the list, they will call for motions from the committee. A motion for a moderated caucus means that for a specific amount of time, delegates will not have to put their name on the speaker’s list, but will simply raise their placard and be called upon by the moderators. A motion for an unmoderated caucus means that delegates are free to walk around the room and speak with other countries about possible resolutions. Generally, unmoderated caucuses are used when resolutions are being written, or solutions to the topics are being discussed. For example, a resolution on the return of a country’s stolen cultural property may include a discussion of the definition of “stolen” and “cultural property,” a description of the measures that will be taken to recover those items, and what kind of international collaboration will be necessary. Much like the real United Nations, most committees usually work on resolutions they feel are most important to resolve. At the VIKMUN conference, Seattle Academy was represented in four of the five committees; the Indian Cabinet, the General Assembly, the International Maritime Council, and the Security Council. Highlights from the event included Jeremy Alben ’13 winning the Outstanding Speaker Award for his work as the United States in the Security Council. This is Jeremy’s third year participating in Model UN, and over the season he and fellow veteran delegate Rachel Habib ‘13 took leadership roles in many of the meetings. Other competitors included Katie Hodgman ’13 (Djibouti, Maritime), Sophie Reingold ’14 (China, Security Council), Maddy Lewis ’15 (Indian Cabinet), Lillian Hubbell ’15 (Indian Cabinet), Kelsey Malone ’16 (Chile, Maritime), Jamie Pearl ’16 (Indian Cabinet), Noah McLean ’16 (Belgium, General Assembly), and Lizzie Willsmore-Finkle ’16 (Chile, General Assembly). After a successful first year at this competition, the Seattle Academy Model United Nations club hopes to return and compete at VIKMUN again, and is excited to add more conferences to their list next year.